This is a scripted object mod, and the chances of conflict are next to non-existent. Again, these hampers are brand new objects and not default replacements. This functionality is already present in Awesomemod, so you don't need this mod if you use AM. However, this is a brand new object, and it won't conflict with AM. The Super Hamper is super easy to use. Choose from one of 3 available models (or choose 2, or choose all 3) and place anywhere on your sim's home lot. 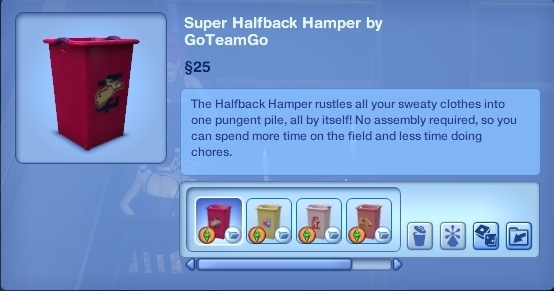 Once every sim hour, the hamper will look for rogue laundry and gently collect it with super scientific magnet-tubey-thingies. 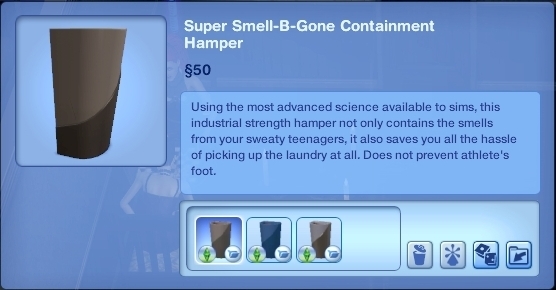 Your sims laundry will be unharmed and safe at home in the laundry bin. It is safe to place more than one Super Hamper on your lot, however, this is unnecessary and I do not recommend it. You can, of course, place as many normal hampers as you like on your lot alongside your Super Hamper. The Super Hampers can be found in the buy catalog in the same place you find the normal hampers. Download the Super Hamper Script below. Download at least one Super Hamper object, also below. You MUST download both the script and at least one object! Super Hamper Script - You must download this. Super Hampers - You must download at least one of these. You can also download and use all three. This XML tuning mod increases the amount of clothes a Hamper can take before being considered full. This mod was built with patch 1.63 and may work for earlier patch levels, but I am unable to verify this.. This mod will conflict with any other mod that alters the Hamper_0xb1ccd50c9063965b resource in the GameplayData.package. I do not currently know of any mods that conflict with this mod, but they probably do exist.